Those of us who “know” picture books are very familiar with the wordless and almost wordless variety. I’m not convinced, however, that “non bookies” are aware of the genre or that they understand the important role a wordless picture book can play in early literacy. Wordless picture books “tell” a story using illustrations only. They encourage active participation and, as a result, are super for stimulating language development. Wordless picture books also move children and adults to a level playing field; a young child is equally able to “read” a well-designed story because there are no words to be decoded. A wordless picture book is great for multilingual families because stories can be discussed in any language. Perhaps most importantly, wordless picture books provide a great platform for story retelling. A youngster who enjoys a wordless picture book with an adult, should be encouraged to retell the story, using his own words, to another adult – a great way to improve the child’s ability to retell a story and thus helping to prepare the child for formal reading instruction. Have you ever suffered the loss of favorite toy? Perhaps it was broken beyond repair? Daisy is an adorable little dog, oozing with personality. She loves her beautiful red ball. Daisy kicks it and bounces it and snuggles with it on the sofa. One day, while enjoying a walk, Daisy encounters a doggy friend who is too exuberant and accidentally punctures the red ball. 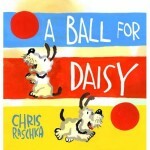 Daisy is inconsolable; she can’t believe what she sees and she tries everything to make her red ball whole again. Unfortunately, the ball has been destroyed. Thankfully, Daisy’s friend understands her distress and, when she next visits the park, a lovely new blue ball is waiting. 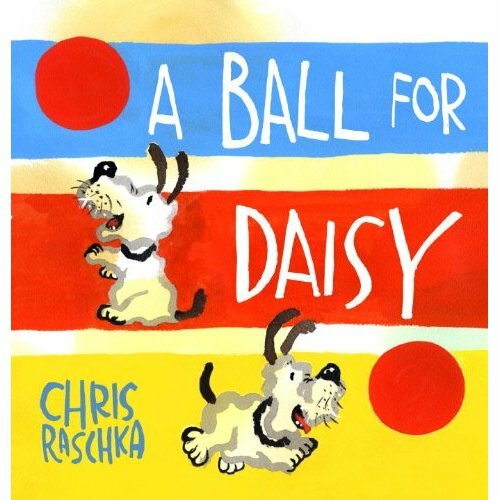 Breezy, bright illustrations, perfect for sharing with a group, guide readers (and non “readers”) through A Ball for Daisy .